Mac's UFO News: Red UFO Over Magdalena, New Mexico On May 3, 2012, Video News. 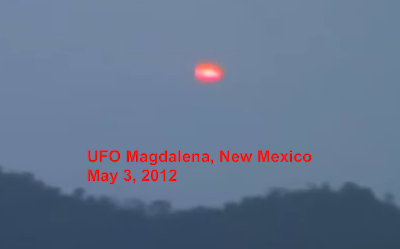 Red UFO Over Magdalena, New Mexico On May 3, 2012, Video News. This orange disk was seen last week over Magdalena. Often orange UFOs are mistaken for Chinese lanterns, but as you can see with the zoomed in shot, this thing is huge!!! The person who took this shot has a great camera with a great zoom on it. I wish more UFO hunters had such a camera.